A good cookbook is a treasure. I love scouring food blogs and Pinterest as much as you do, and in our kitchen you'll often find us hunched over the laptop consulting the latest bookmarked recipe. But holding a book, whether brand new or covered in food stains, and flipping through pages of recipes and menus and little notes about preparation... well, that's something entirely different. I don't read cookbooks on my Kindle. No, I prefer to flip through the pages with my hands covered in flour and something bubbling behind me on the stove. Here are three books that have been in heavy rotation recently. The Heart of the Plate: Vegetarian Recipes for a New Generation by Mollie Katzen. You all know Mollie, right? She's the queen of delicious yet simple plant-based food. I can't get enough of her recipes and her writing. She wrote a book called Vegetable Dishes I Can't Live Without and it's a knock-out classic. I'd been eyeing this at our local co-op one day, thumbing through its pages and fantasizing about all of the new cooking it would inspire me to do and! lo and behold, it found its way under our little Christmas tree this year. Husband knows me well. Moosewood Restaurant Daily Special by the Moosewood Collective. Mollie was part of the original Moosewood Collective, but I'll leave this one in its own category. 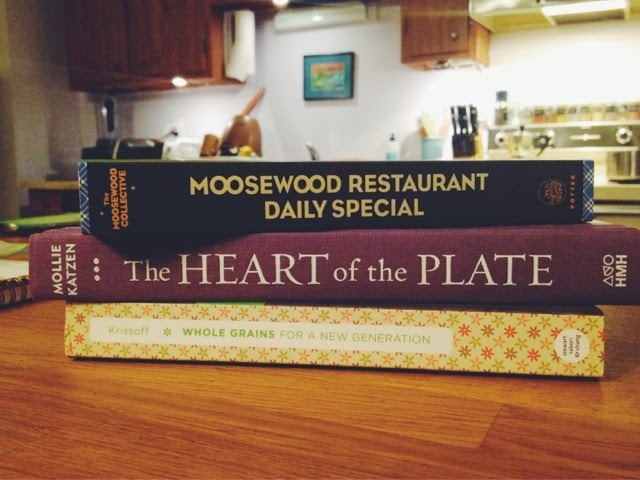 This one was also a Christmas gift, this time from the Doc, and it is extra special because it shares all of the beautiful daily soups, stews, salads and extras from the famous Moosewood Restaurant in Ithaca, New York. And actually, I've never been there so it seems I should put that on my 2014 road trip list. Whole Grains for a New Generation by Liana Krissoff. I'm still loving this one from a recent round of the FSC Book Club. Lots of hearty recipes with new grains (actually, they're mostly ancient grains, but you know) and lots of flavor. She shares an oaty biscuit type recipe that's weird and sublime and a host of other side dishes, entrees and extras that have become regulars. What cookbooks are on your kitchen counter these days? I'd love recommendations!